You need to improve results. Now. You are focusing on the one thing you have to improve in order to give yourself the best chance of rapid improvement: prospecting (as it is the key to improving everything else). But there is still more that you could be doing. If you can only improve two things, and prospecting is the first, then make this the second. The magic bullet for producing results, if there is such a thing, is surely self-discipline. It is the master key to success in sales—and everything else. You have been told that you need to learn time management. The truth is, there is no such thing as time management. There is only “me management.” Time ticks along relentlessly and there is absolutely nothing you can do to “manage it. The only thing you can manage is what you decide to do between the big lines on the clock and during the blocks on your calendar. Improving your results, including ensuring that you do the prospecting work that will help you improve all areas of your sales, means making certain that the choices you make have an impact on your results. Your improvement is going to be found by focusing on your priorities, instead of allowing yourself to become distracted and having your attention diverted from what needs done. 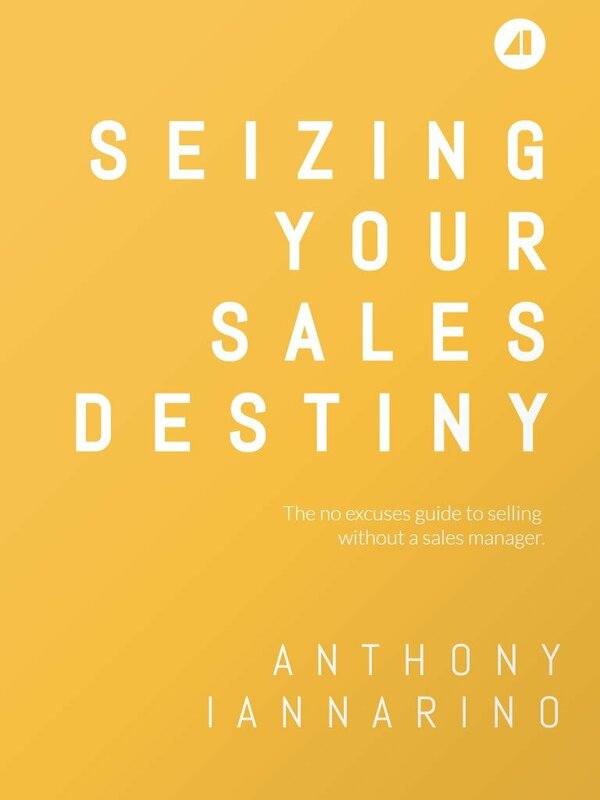 Salespeople fail because they cannot exercise their self-discipline and manage themselves, and because they don’t temper the freedom that accompanies the role of salesperson with an even greater personal responsibility. To produce the results that you need to produce, you have to understand some of the iron laws of time. First, time spent cannot be recovered. Meeting your goals and meeting your quota requires that you produce certain results by a certain date. If you have a quarterly goal or quota, you cannot recover a day that is poorly invested in non-priority, non-impact activities. You want to hang with gang and talk about the big game? Have it at, but have it after work (no, you can’t use your lunch break because you need to spend that time with your dream clients, your clients, or your internal team with whom you need to develop the relationships that allow you to generate results). The second iron law of time is that you will never have as much of it as you believe you need. But “not enough time” will be just enough to produce the results that you need if you invest wisely the time you are given. That means having the self-discipline to make the choices that make the most of the your limited time. The third iron law of time is that there is no tomorrow; the only control you have over time is the decision you make to act in this very moment. Self-discipline is what it takes to do what needs to be done today, instead of procrastinating and putting off what needs done until tomorrow—a tomorrow that never comes. The reason that procrastinating and putting off what needs done until tomorrow doesn’t work is that when you get to tomorrow, you still don’t have any greater self-discipline than you did the day prior. Exercising and improving your self-discipline requires that you take action now. You’ll have the same improvement in your prospecting and your sales results by putting off what needs done until tomorrow as you have in improving your health by putting off eating right and exercise. In both cases, there is no tomorrow, only the decision you make now. If you can improve only two areas of your sales, start with prospecting. But starting with prospecting will require that you also work on the one attribute and skill that enables all the rest, and that is self-discipline. Is there such a thing as time management, really? Doesn’t that language divert you from managing the one thing that is sometimes the most difficult to manage well, yourself? Is a fancy planner really what you need to produce better results, or is it something more fundamental and more difficult? It’s easy to believe that there is more time, but time is truly finite. Why do you believe you can make up for lost time, when you know that the time you have lost cannot be recovered, and all you have really done by investing it poorly is given yourself even less time to produce the results that you need? How do you ensure that you invest your time wisely? How to you make certain that the decisions that you take are based on your priorities and the impact that you need to make? How do you make the most of the time you are given? What kind of discipline does it take to make those choices? How do you develop that discipline? What needs to change between the time you decide to procrastinate and put off the work that you know you need to do and the future date that you believe you will actually do that work? How will you change what needs to change? Who do you need to be to make that change?